Ski course for children, restaurant for children, child-care, flat area. The perfect ski area for families with children. Freeriding in the Powder Department. 13 Freeride Runs, GPS tracks, Freeride Checkpoint. One of the biggest and most varied snow terrain parts in Austria in autumn and spring. Snow-reliable skating track at an altitude of 2,600m at the Gamsgarten mountain station. The BIG FAMILY Ski Camp is located separately, yet amidst the ski area. Gently declining pistes for beginners are perfect for introducing little guests to a big pleasure. 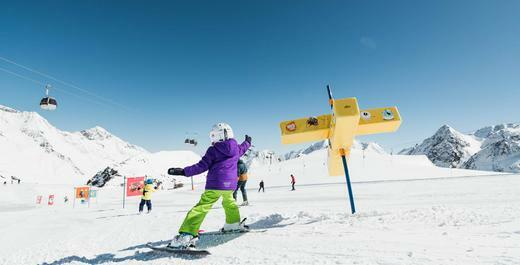 An exercise lift and four magic carpets ensure that children can start into the adventure of skiing easily. More experienced children can ski on the eleven blue pistes. All lifts are easy to board and get off with kids. And once they are adept skiers, they can find new challenges in the Camp, e.g. on the BIG Family Funslope, a track with many turns, bumps and jumps. Or on the permanent race track with time-taking. Time flies on skiing days. Leisure skiers love the ski area in the Stubai Valley for its mix of wide pistes, dreamlike nature and culinary hotspots. The Schaufelspitz inter-connected ski area, a large area covering four glaciers, is marked by blue and red pistes. There is also a smaller version covering three glaciers. In-between of all that skiing you can enjoy culinarybreak stops at the fantastic sun terraces that can be found in the whole ski area. Particularly worth a visit is the first floor of the Schneekristall-Pavilion. Cappuccino, Aperol or weiss beer taste twice as good when the sun roof is open. The highlight of every skiing day – a culinary break stop at Schaufelspitz Gourmet-Restaurant . If you’re the athletic type, Austria’s biggest glacier ski area offers plenty of opportunities to test your stamina. The 10km-long downhill leading from the Wildspitz top terminal (3,210m)to the Mutterberg base station (1,750m) is a true challenge even for best-trained thighs. Another challenge for the ambitious is the black piste with the name of “Daunhill”, which has a maximum gradient of 60%. A compelling invitation for all daredevils. 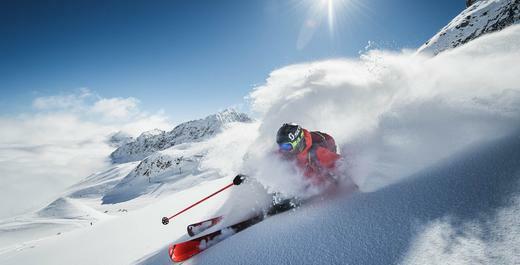 Nine ski routes and 13 Powder Department runs – GPS-mapped routes in the open ski area make the Stubai Glacier accessible for freeride skiers and skiers with an affinity to ski mountaineering. Numerous Freeride Camps offer professional know-how for safely entering the world of the open ski area off the marked pistes. 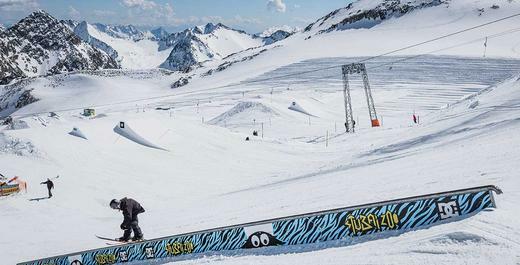 The Stubai Zoo snow park ranks among the biggest meeting points for freeride skiers and snowboarders in the Tyrol. International top athletes (among them snowboard Olympic Snowboard Champion Sage Kotsenburg and freeski legend Jon Olsson) appreciate the snow park with its easy-, medium- and pro-lines, the top shaped kickers and many obstacles. The BIG Family Fun Slope , a 1000m long track with banked turns, bumpy passages and fun obstacles awaits skiers and snowboarders of all ages at the Eisjochferner.